H. has been on a translator’s retreat in Seneffe half a dozen times. There are photos of him in that first-year album. Darker hair. Slimmer build. The same dreaming expression hidden by the glasses. 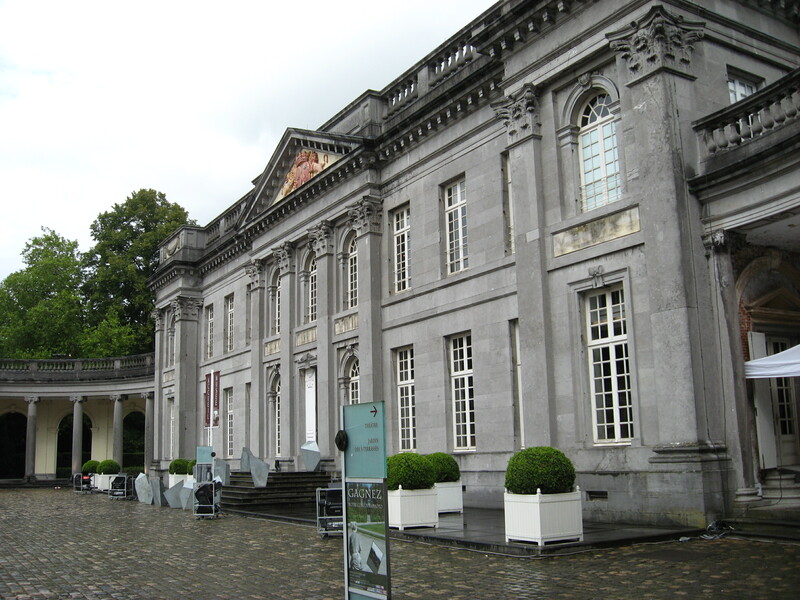 The château of Seneffe has been turned into a museum of silverware. 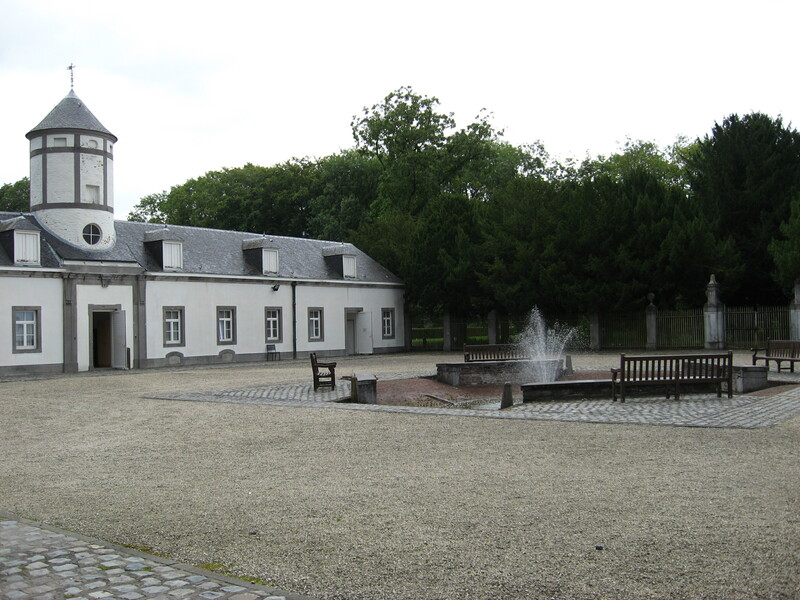 The Commons – former servant quarters and stables – host every summer a retreat for literary translators from all over the world working on books by French-language Belgian writers. We take a walk around the grounds of the domaine, which are gradually being restored to their original 18th century design. 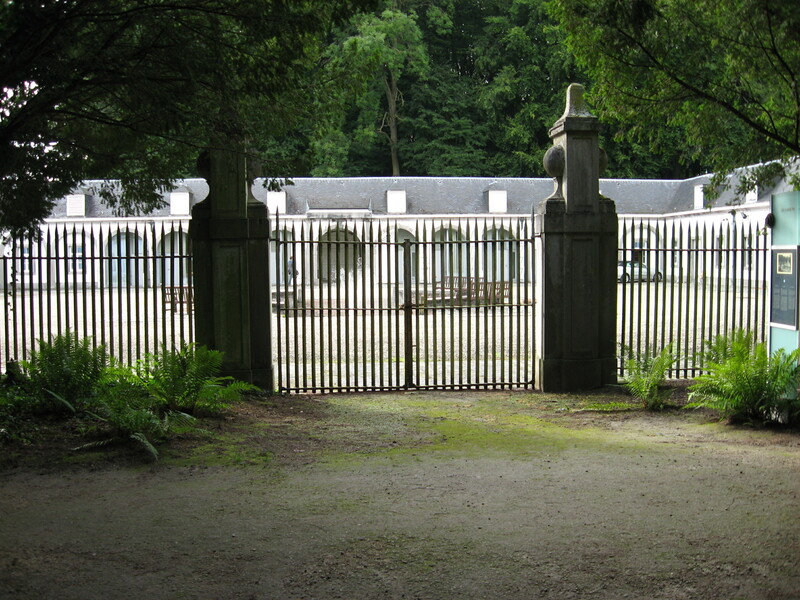 There are the symmetrical hedges of the French-style gardens, an aviary with brightly-feathered budgies, and two lamas grazing in an enclosure. There is the thick, luxuriant woodland, with tall, dark trees, very still against the grey Hainault sky. 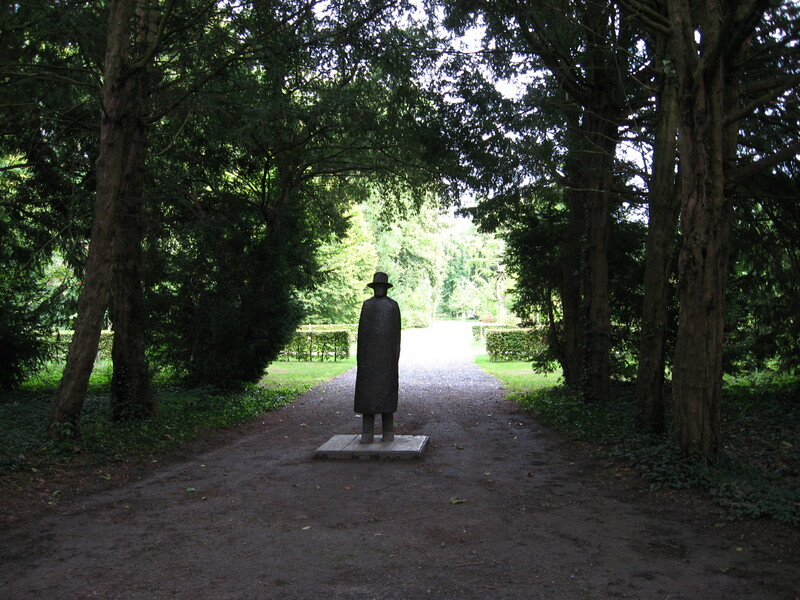 At the bottom of a shady, tree-lined path, the silhouette of a tall man in a wide-brimmed hat – a statue – standing in front of a stone bench. From where I’m standing, it looks like a quirky painting by Magritte. 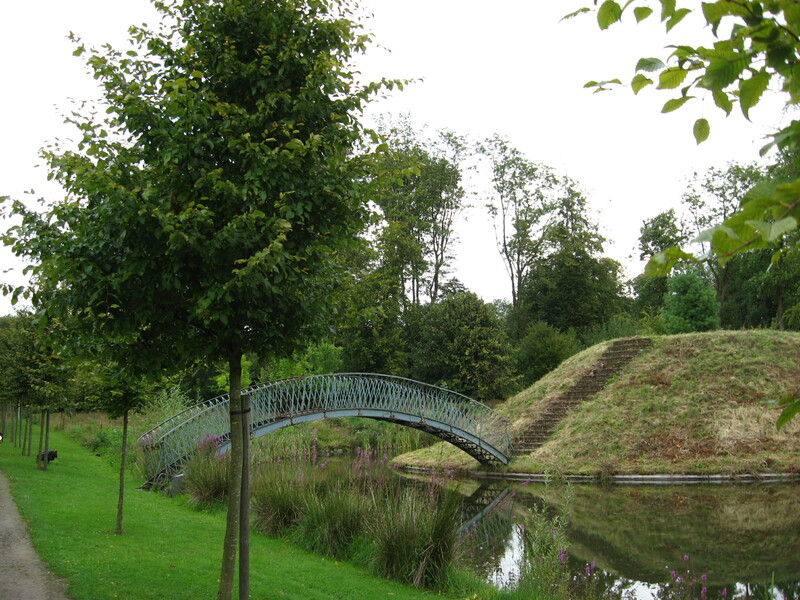 I stop to admire a rusty iron bridge that curves across a pond, to a kind of mound with a flat top. Monet would certainly have painted this, if he’d seen it. The kind of mound you could stand on and recite Shakespeare at the top of your voice. Later, in the seminar room, translators from Rumania, China, Ukraine, Germany, Poland, Bulgaria and England take their seats at a large, oval table strewn with dozens of books by French Belgian authors. Two writers are introducing a literary magazine about to celebrate its three hundredth issue, Marginales. A magazine that launched many an illustrious career. At dinner, the chef steps out of the kitchen to announce the composition of every course. Apparently, it is the tradition at Seneffe. Tonight is a special occasion, the birthday of one of the translators. The Directrice makes us wear party hats as the chef places before the birthday boy a strawberry cake with a steel tube sparkler pouring out a flow of shooting stars. We all cheer. I listen to everyone talk about the books they are translating from French. I feel as though I’ve been introduced into an international family of wordsmiths., of language shapeshifters. Some of them are regulars at Seneffe. In the morning, after a couple of hours of working on my translation, I go back to the seminar room and start avidly looking through the books on the table. To be invited to a residency at Seneffe, the requirement is that you translate a French Belgian writer. So I’m looking. This entry was posted in Travel and tagged katherine gregor, languages, literary translation, scribe doll, seneffe. Bookmark the permalink. Thank you, Katia–I’ve never heard of Seneffe, but reading your post and seeing your photos, I feel as if I’m really there! I hope you do have that opportunity to return in a residency–so much history. Judee – is that you? Thank you. So glad you enjoyed it! A fairytale world! Philippa of Hainault is one of my favourite Queens of England. I wonder what she would make of the present day. A fascinating place and it is so good to know that old fashioned courtesies still exist. Enjoy! I first read about Philippa of Hainault in Maurice Druon’s series ‘Les Rois Maudits’ which I got thoroughly engrossed in as a teenager. Lovely mise-en-scène, conveying a sense of you wandering in silent contemplation among your new family of wordsmiths, waiting for the next translation to wink at you. How exciting, to participate not only in a part of history, but in history also in the making in the renovations! And thank you so much for being industrious and painstaking enough to share the lovely photos–they are amazing (and so are you!). Thank you, Shadowoperator. It was a great treat for me to visit Seneffe. I feel like I’m right there with you, the descriptions are so vivid! And yes, that photo of the statue is so reminiscent of Magritte. Love it! Yes, I actually thought of you when I posted that photo. So glad you like it.